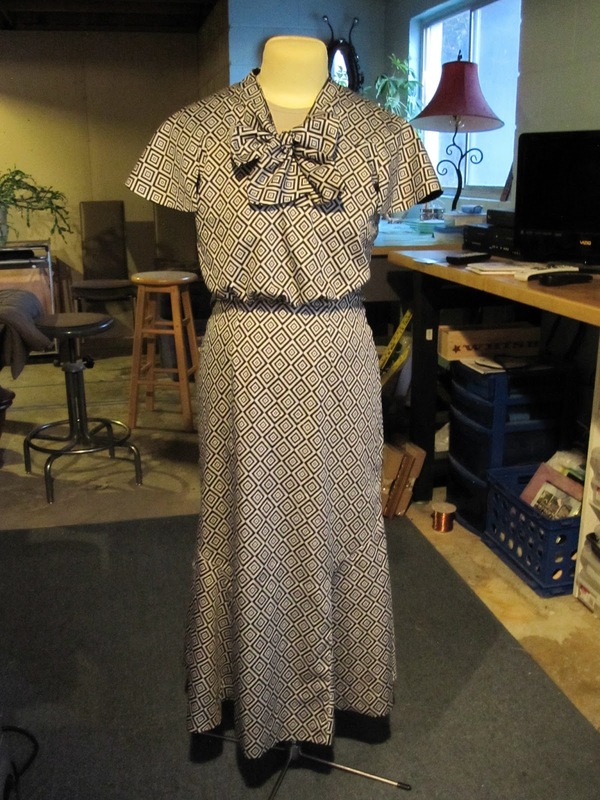 Well, here it is--the first 30's dress. 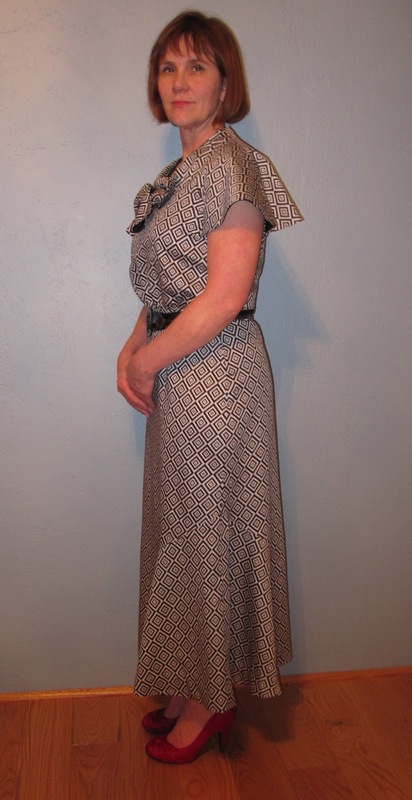 I suspect there will be more because I celebrated the completion of this dress by buying two more 1930s patterns. Before I start those, however, I will head into the 1940s and Sew for Victory with Lucky Lucille. Here's the dress on Tillie, my unpaid assistant. It needs pressed. I think Tillie has more of a waistline than I do, but she hasn't spent the weekend at the rodeo eating chili-cheese fries. Here is the dress on me from various angles. My husband is my patient photographer. Patient because I won't hold still and I close my eyes every other shot and then make him do it again. 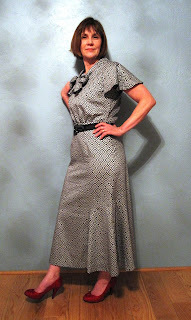 Is it just me, or is does the pattern model appear a bit more willowy than me? I am so tempted to use my photo program to stretch my photo in a vertical direction...but that would be wrong. 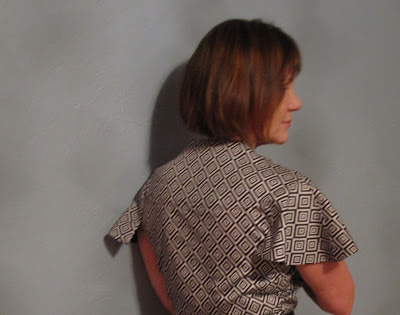 I'm really happy with the back--see how well the pattern matches between the yoke and the bodice? It's hard to tell where one ends and the other begins. And from the side. The first photo was a total profile, but my husband made me look at him because he said it looked like a mug shot. And lastly a fun artsy shot. Aren't the red shoes perfect with this? 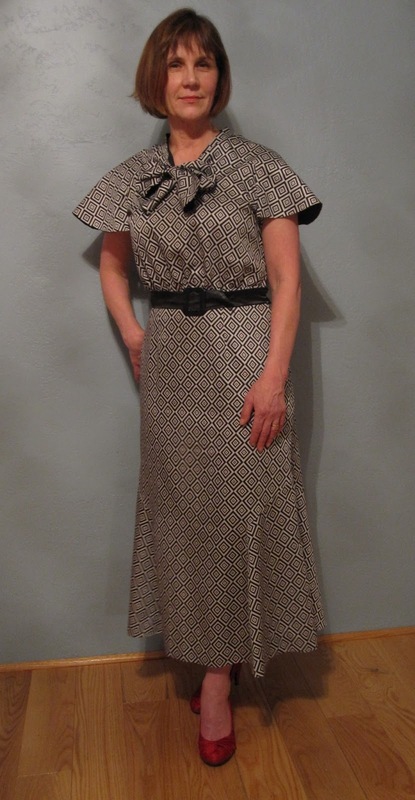 So that's it for the 30's dress. I can't wait to start my 40's dress. 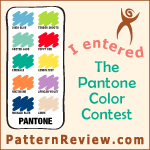 Tomorrow I start tracing the pattern. 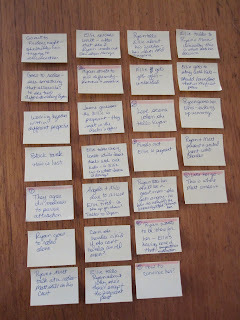 Yes, I have been writing. 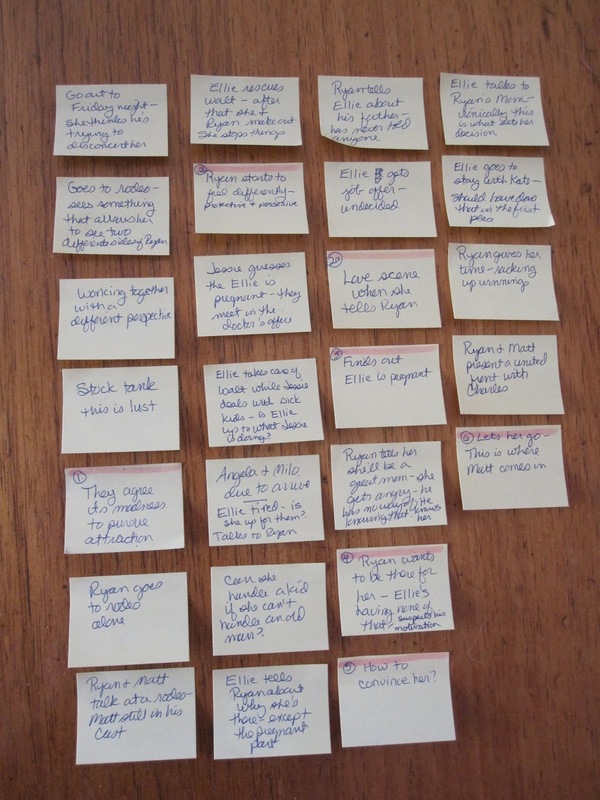 I plotted out the rest of the book on tiny little post-it notes which I stuck to the kitchen table and rearranged until it felt right. 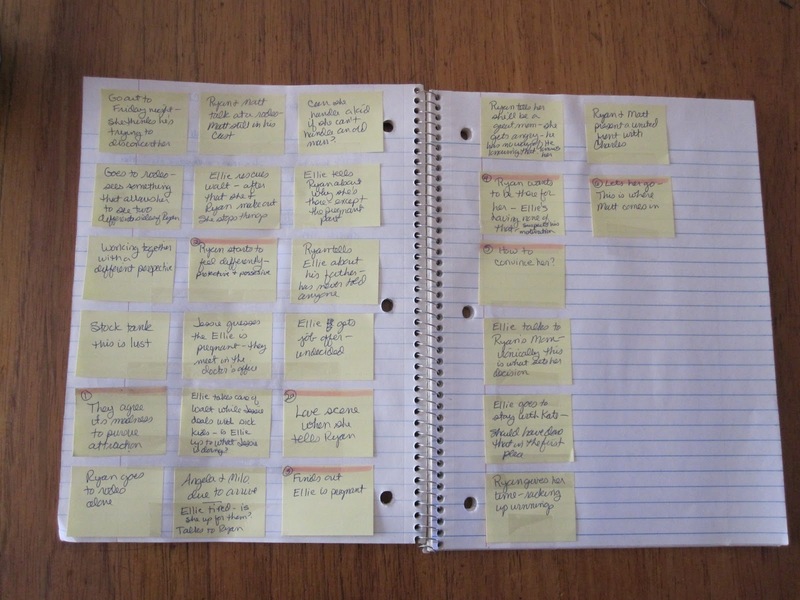 Then I put the post-its in a notebook and taped them down for travel because this past weekend was a rodeo weekend. Every year I have a vendor booth at the local ranch hand rodeo, so for the past three and half days I sat in my booth, writing away and eating chili cheese fries. I actually produced quite a few words and had a great time. Well done! The dress looks lovely! Thank you, Anthea. It's really comfortable, too. Oh Wow! I love that dress. I have a feeling I was born in the wrong era. I don't like to flaunt skin and these style dresses seem to suit me. Love the red shoes too - way to make it contemporary! And I'm also loving the writing stuff too. 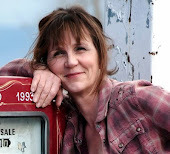 Hi Marcie--Thanks for stopping by. I hear you about the wrong era. 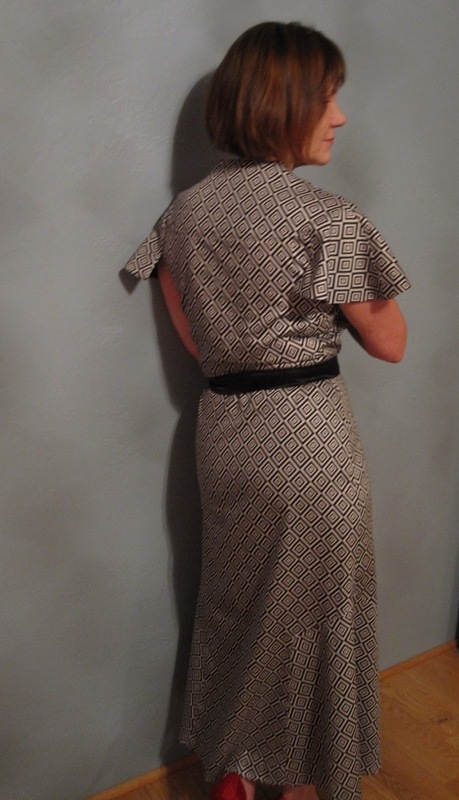 The dresses from the 30s, 40s and 50s speak to me, too. Lots of people are dressing retro now, so we must not be alone. Love the dress and the red shoes are perfect with it! I agree that fashions from those decades need to make a strong comeback. Start the trend, Jeannie! Good grief, I wish I could sew! Beautiful dress and the red shoes are perfect with it.